I was sent an amazing book recently and I'm so excited to share it with you here. It's called 101 Kids Activities That Are the Bestest, Funnest Ever! : The Entertainment Solution for Parents, Relatives & Babysitters! It was written by my friends, the ultimate Super Moms, Holly Homer and Rachel Miller at Kids Activities Blog. What a great resource for chasing away the summer boredoms! The grammar in the title makes my OCD tendencies go crazy but other than that I really like this book. These kinds of fun activities are a great way to slow down, spend some time with your kids, and just savor the days with your little ones. There are tons of great activities for both indoors and outdoors, big and little, quiet and loud. I especially love that each of the activities include modifications to make it easier for younger children or more challenging for older children. There are lots of great colorful pictures to help you get a good sense of how the project will work. My kids have already flipped through it and easily identified the next 20 projects they want to do. Want to check it out for yourself? Keep reading and be sure to enter the giveaway later in this post! In a large mixing bowl, mix the baking soda and the cornstarch together. Add the warm (almost hot) water, stirring until it is the consistency of pancake batter. 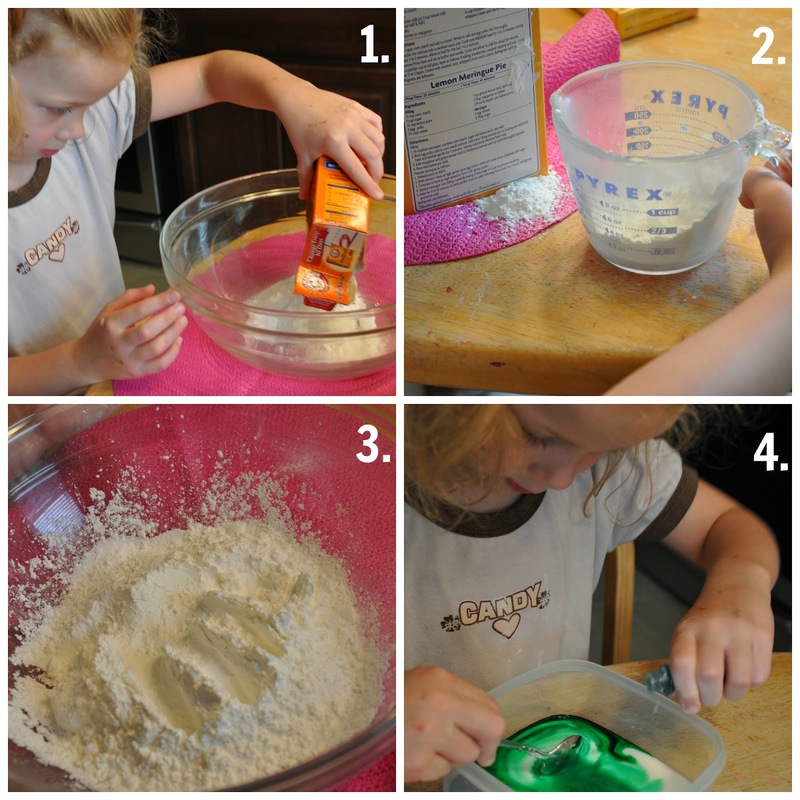 Split the recipe into several containers, adding the food coloring of your choice to each. Use the homemade paint to create a scene or flick it with a paintbrush into a modern masterpiece. It is best to work fast because the paint dries quickly (but can always be diluted with the addition of more warm water). Once the painting is in place, it is time for something a little extra. Spray the artwork with the vinegar-filled bottle and watch what happens. Your artwork will sizzle and pop! A bucketful of water splashed across the art can make it disappear. Because that is fun too, you might not want to wait for rain! If a paintbrush is hard to negotiate in the paint, give your children a spoon and let them drip or drop spoonfuls of paint onto the pavement. For the little ones, be sure to fully supervise when they spray vinegar. It can sting little eyes. This activity is an easy way to work in a lesson on reactions between acid and base chemicals. Talk about why this works. Maybe you can have your budding scientists adapt the recipe to see whether they can get bigger bubbles and more fizz in their next batch of paint. Mixing the ingredients was super easy. I talked with my kindergartener about math and measuring. She loved mixing up the two powders with her bare hands. What a silky texture it was! Of course, anytime she gets to use food coloring is a highlight of her day. But I have to watch closely or she will squirt the whole bottle in the bowl in less than a second! We ended up with this enticingly colorful tray to bring outside. It made me giddy just looking at it! The kids were quick to start painting the driveway. They experimented with different colors and different brushes. After pushing their patience limit, the paint was FINALLY dry. They just couldn't wait to use the squirt bottle and see what the vinegar would do! One squirt and the colorful paint got all fizzy. Cool! Squirting the whole stripe made it all bubble and sizzle. There was lots of "ooohs and ahhhs" over this. 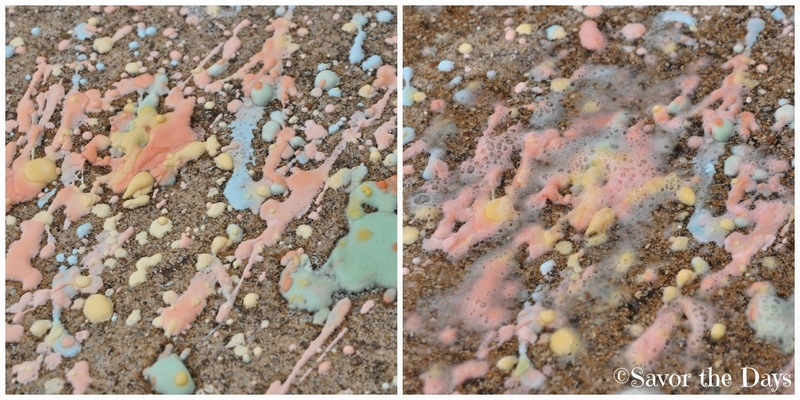 They tried a multi-color splatter paint with the same amazing effect. Their art work was alive! What a fun activity! This is just one of the cool projects your kids will love in the 101 Kids Activities That Are the Bestest, Funnest Ever! : The Entertainment Solution for Parents, Relatives & Babysitters! Disclaimer: I was not compensated for this review. I was given a copy of this book for review purposes but my comments about it are entirely my own. This post does include affiliate links so if you click over to Amazon through this post and buy the book then I will make a few cents which just helps me buy supplies for the next cool kids activity that we do. Thank you! Thanks SO much!!! I love the bright colors you got with yours...better than I usually get! This is really neat. Thanks for the chance..